Whether you are creating a traditional cottage style kitchen or the latest minimalist designer look, nothing beats the look and feel of a solid wood worktop. 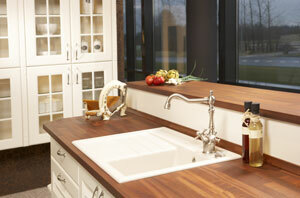 With a solid wood worktop your kitchen will be unique, because no two pieces of wood are the same. It will be solid and tough. It will be easy to live with, warm to the touch and durable. Whether you choose a light blonde wood like Maple, a rugged traditional wood like European Oak or a wild stripy exotic wood like Zebrano you can be assured that they will all be ethically sourced from managed forests. The timbers are first air dried then kiln dried to 8-10% moisture content before being manufactured into worktops in a modern factory in Denmark. All our solid wood worktops are made from finger jointed staves of hardwood which are glued together with a super strong construction adhesive. 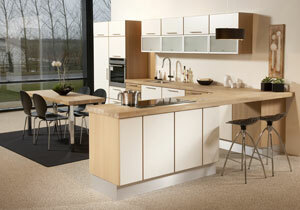 The staves are 41.5mm wide, and the width of the worktop is simply determined by the number of staves that are used. 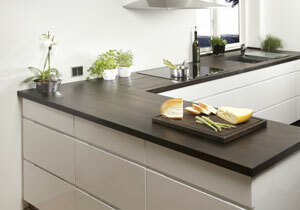 Our stock worktops are either 664mm or 913mm wide but we can order other sizes to suit your project. 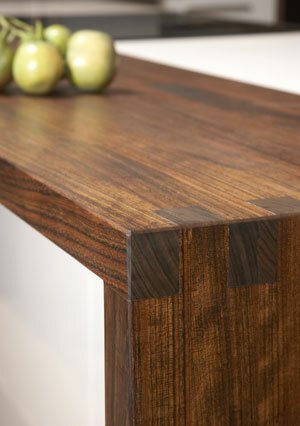 We can even get continuous stave worktops with no finger joints in most species. Solid wood worktops must be treated with oil to protect them against the ingress of moisture but this needn’t be a chore. Modern wood treatments such as TopOil and PolyXoil by Osmo or HaBiol will enhance the appearance of your worktop whilst ensuring long lasting protection.